Today's post will deal with the shades of the two re-issues of the 5c and 7c values. Unitrade lists a few shades for the 5c, although as we shall see, there are more than what Unitrade lists, and none of the shades are actually violet, but rather all are either shades of purple or lilac. Curiously, there are only two listed shades of the 7c red brown: red-brown and pale red brown, even though there is a world of difference between the shades of the wet printings and the dry printings. The so called pale red-brown of the 7c dry printing is actually closer to chestnut on the Stanley Gibbons Colour Key, and is quite distinct once you become familiar with it, although if you are not used to seeing it, you could easily miss it and classify it as a common red-brown shade. Again, in keeping with the format of the previous posts, I will show examples of each shade and will cross reference the Unitrade shade names to the equivalent shades on the Stanley Gibbons Colour key, indicating how swatches om the key have been extrapolated to arrive at the actual shades. In actual fact none of the shades I have seen on this stamp are violet. All of them are actually shades of either lilac or purple. The shades of the wet printings on normal paper display the most variation, while the shades of the wet printing on thin paper and the dry printing appear to be quite uniform. Both the so called grey violet and rose-violet seem to exist only in the wet printings. Unfortunately, this is a colour that tends to show up on scans as very blackish, so you will need to look at the scans for a few minutes to allow your eyes to adjust so that you can see the differences between the colours. The stamp on the left is the well known wet printing on the so-called thin paper, which is actually not thin at all, but that is a subject of another post. 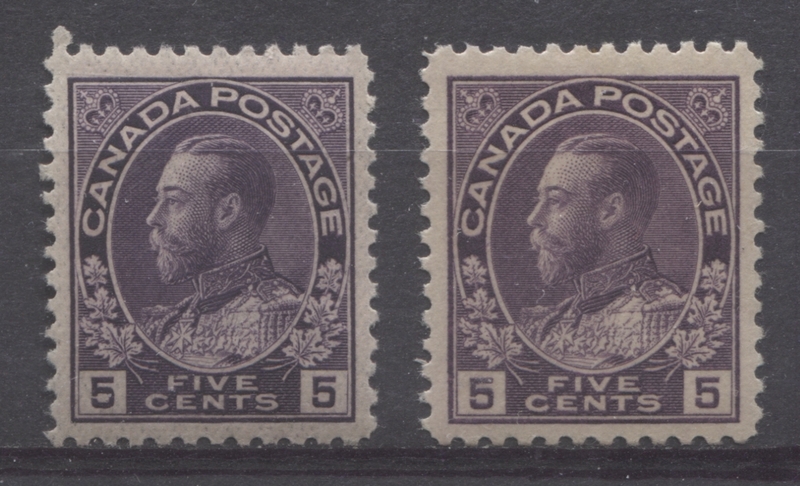 The shade of this stamp is uniformly blackish purple to very deep reddish lilac. I have not come across any significant variation in the shade of this stamp, though it is almost always darker than the regular wet printings that are not the grey violet or blackish purple. The stamp on the right is the dry printing with the re-drawn frameline (all of the dry printings of this value have the re-drawn frameline). The shade of this stamp is very close to the first one on the left above, being a deep reddish lilac. Again, all of the dry printings I have come across are this shade. Deep dull reddish purple - similar to the dull reddish purple, but deeper. Hopefully this helps you with identification of the shades on this stamp. Unitrade lists only two shades for this stamp: red-brown and pale red brown. The naming of the shades is close to their true colours although the pale red-brown and the red-brown on thin paper are really shades of chestnut, while the wet printings are deep bright red browns or lake-browns, as opposed to plain old red-brown. Bright red-brown - similar to the red-brown, but a touch brighter. Bright red brown - similar to reddish brown but redder and brighter. Deep bright red-brown - similar to above, but slightly deeper.